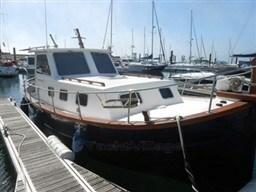 REF1235: This Sea Ray 315 Sundancer of 2003, has been maintained in very good condition by her owner. Powered by Mercruiser MPI 5.0 - 2 X 260HP - Gas engines - that cruise her around 26 knots and top at 35-36 knots. Fitted with Garmin GPS, electro-hydraulic passerelle, ceramic cooker, microwave, TV, car type stereo adn many other. 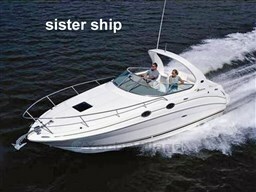 She is a perfect cruiser for a family or two couples since she offers two double berths in two cabins. You are welcome to contact Alvea Yachts Brokerage for additional information about this Sea Ray 315 Sundancer for sale. Dear Sirs, I have seen on YachtVillage your offer about Sea Ray Boats Sea Ray 315 Sundancer - 2003 (code: 267389). I am interested in the offer and would like you to contact me. Thank you. If you would like to find out more about this boat and any other boats of this type and range, Digibusiness Srl,the Company that manages YachtVillage, and Alvea Yachts Brokerage, the Company that exhibits the Boat, must necessarily acquire some simple details about you (name, surname, email address and, if needed, your telephone number). These details will be processed according to the purposes and means of the processing indicated in the privacy statement under the PRIVACY Section of this website, referred to herein.